Drought-induced tree susceptibility is a major risk associated with climate change. Here we report how an 11-week drought affected tracheid structure, gene expression, and above- and belowground growth in 5-year-old Norway spruce trees (Picea abies) under controlled conditions. The canopy of trees subjected to severe drought had significantly less current-year needle biomass, and fewer tracheids and tracheid rows in current-year shoots compared to fully watered control trees. Belowground tissues were more strongly affected by drought than aboveground tissues. 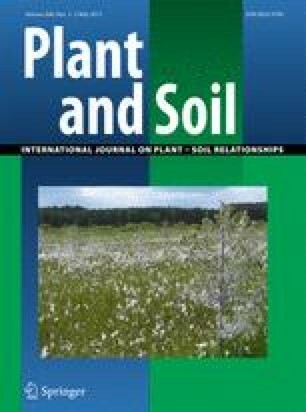 In fine roots (<2 mm diameter) severe drought significantly reduced root biomass, root diameter, root length density and root surface area per soil volume compared to the control. Tracheid diameter and hydraulic conductivity in fine roots were significantly lower and tracheid flatness higher in trees subjected to severe drought than in control trees, both for long and short roots. Transcripts of the drought-related dehydrins PaDhn1 and PaDhn6 were strongly upregulated in stem bark and current-year needles in response to drought, whereas PaDhn4.5 was down-regulated. This study demonstrates that drought reduces biomass and hydraulic conductivity in fine roots and needles. We suggest that the ratio between PaDhn6 and PaDhn4.5 may be a sensitive marker of drought stress in Norway spruce. We thank A. E. Nilsen and G. Østreng for taking care of the plants, C. Kierulf for assistance with harvesting, M. Kjos for dehydrin analysis and Dr. S. Eich-Greatorex for allowing us to use the WinRhizo equipment. The project was financed by the Czech Ministry of Education (grant no. 6215648902), the EEA Financial Mechanism funded by Iceland, Liechtenstein and Norway, the Norwegian Financial Mechanism (grant no. A/CZ0046/2/0009), the Mendel University in Brno (grant IGA 12/2010), and the Norwegian Forest and Landscape Institute. Velasco-Conde T, Yakovlev I, Majada J, Aranda I, Johnsen Ø (2012) Dehydrins in maritime pine (Pinus pinaster) and their expression related to drought stress response. Tree Genet Genomes. (in press) (doi: 10.1007/s11295-012-0476-9).